I need to read an analog signal at about 50khz (for maybe 50-500 samples, not sure yet). The reference seems to indicate the analogRead() takes about 100us, which is good enough for 10khz. Is this limitation set by the Arduino libraries, or the ATMEGA chip? P.S. does anyone know how fast the digital read is? The analog read speed is a limitation of the ATMEGA chip. There are standalone ADC chips which are a lot faster, but I have no experience with them. A digital read takes 1 instruction cycle. I think the ATMEGA chip has a 1 to 1 mapping from clock speed to instruction cycle, so a digital read would take 1/16th of a microsecond. By default, the successive approximation circuitry requires an input clock frequency [ADC clock] between 50 kHz and 200 kHz to get maximum resolution. If a lower resolution than 10 bits is needed, the input clock frequency to the ADC can be higher than 200 kHz to get a higher sample rate. The ADC clock is 16 MHz divided by a prescale factor. The prescale is set to 128 (16MHz/128 = 125 KHz) in wiring.c. Since a conversion takes 13 ADC clocks, the sample rate is about 125KHz/13 or 9600 Hz. So anyway, setting the prescale to, say, 16, would give a sample rate of 77 KHz. Not sure what kind of resolution you would get though! Operating the ADC with frequencies greater than 1 MHz is not characterized. Wow. Thank you jmknapp and oracle. So if I just include your defines in the top of my code and the function calls in my setup, I should be good to go? As in, analogReads will just return a lot faster (at a bit lower precision)? How exactly is your code setting it to a prescale of 16. I don't see any numbers in there..
Bear in mind that the Arduino digital and anlog read/write abstractions that make this platform so easy to use, do reduce the execution time over what could be achieved if one used low level code to directly access these functions. The arduino functions will be slower than the timings quoted above. For example, the Arduino digitalRead function first does a lookup to convert the Arduino pin number to an actual port and pin. It then disables any PWM function that could be running on this pin. And finally, it executes another dozen instructions or so to actually read the port. I would think it would take well over twenty times longer for each digitalRead compared to directly accessing a specific low level port pin. AnalogRead also does the Arduino pin mapping lookup and it sets the analog reference bits each time analogRead is called, although this probably represents a small fraction of the total ADC conversion time. As it stands above, with FASTADC defined as 1, the 1000 calls to analogRead() take 16 msec (16 microseconds per call). With FASTADC defined as 0, the default prescale gives 111 microseconds per call. Personally I've been looking into ways to make ADC processing less expensive in CPU cycles, to avoid calling analogRead() which burns over 100 microseconds sitting in a loop waiting for the conversion to finish. Turns out there's a mode where the conversion finishing can generate an interrupt, so that's the route I'm going, so the processor can be doing other things during the conversion (as long as the result is not needed right away!). Do you guys have a sense of how much the resolution or accuracy of the inputs vary as the speed increases? I'm happy to decrease the default prescale factor if we still get accurate readings. (I think it's better in most cases to be accurate and a bit slow than the other way around.) Any thoughts on which value provides the best balance of accuracy and speed? If the tradeoff isn't too bad, you can add a new function, something like analogReadFast, and leave the existing functionality unchanged. I don't know how much the accuracy drops if you exceed the recommended rates in the datasheet, but I would think it would not be good practice to add functionality to the standard Arduino platform that clocked the ADC faster then the manufactures recommendation. And if my math is correct, at 16mhz, a prescale of 64 or less will exceed the 200khz max ADC clock rate stated in the datasheet. Perhaps someone who has the time to explore and document the affect on accuracy could post some information and code in the playground. Oracle, did you have a chance to do any tests on accuracy when you ran the speed tests? When I was doing the speed tests, I didn't know there was a prescaler for the ADC speed. I thought it was fixed for the chip. I didn't know running speed or accuracy tests on that part was possible. It probably wouldn't have mattered to me since I knew my bottleneck was the LCD. And my project is working perfectly now with the timer interrupt library from playground, so I didn't actually need to speed up my loop. The ADC accuracy also depends on the ADC clock. The recommended maximum ADC clock frequency is limited by the internal DAC in the conversion circuitry. 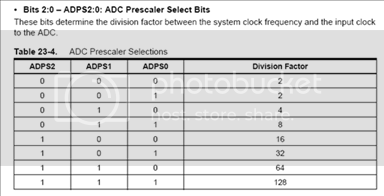 For optimum performance, the ADC clock should not exceed 200 kHz. However, frequencies up to 1 MHz do not reduce the ADC resolution significantly. Operating the ADC with frequencies greater than 1 MHz is not characterized. When using single-ended mode, the ADC bandwidth is limited by the ADC clock speed. Since one conversion takes 13 ADC clock cycles, a maximum ADC clock of 1 MHz means approximately 77k samples per second. This limits the bandwidth in single-ended mode to 38.5 kHz, according to the Nyquist sampling theorem. To me, that's as good as a green light, direct from the manufacturer, to go to 1 MHz and a 77k sample rate--with no significant effect on resolution. I wonder if the use of the term resolution rather than accuracy is significant. That note discusses calibrating an ADC, it is not clear what errors an uncalibrated ADC will have if used outside the recommended clock speeds. It could well be no problem in doing so, but I would not take that app note as a green light to exceed the specs in the datasheet without some real world testing. I wonder if the use of the term resolution rather than accuracy is significant. That note discusses calibrating an ADC, it is not clear what errors an uncalibrated ADC will have if used outside the recommended clock speeds. For most applications, the ADC needs no calibration when using single ended conversion. The typical accuracy is 1-2 LSB, and it is often neither necessary nor practical to calibrate for better accuracies. However, when using differential conversion the situation changes, especially with high gain settings. The AVR uses the test fixture's high accuracy DAC (e.g. 16-bit resolution) to generate input voltages to the calibration algorithm. There are standalone ADC chips which are a lot faster, but I have no experience with them. Does anyone have experience with ADC chips? Also, would using a multiplexer speed up analog reads? I have used the MUX shield to read 16 analog pots, one every 16th cycle of the main loop (which also counts through the MUX output), previously I had used separate analog inputs, each also on a main loop based counter. Only taking one reading per main loop cycle made a huge difference, and this ought to help it even more. (quite a lot, including a lot of "map" and other multiplication and division) thats quite a nice improvement! oh yes i do not notice any difference in the accuracy of the potentiometers as far as i can tell i cant hear any wavering of the controls when set the filter frequency or whatever.